Rip-away velcro panel is amazing! MyMedic: MYFAK | FIRST AID KIT. With the increasing unpredictability of the world around us, there exists a growing trend summarized as Everyday Carry (EDC for short) that expounds the virtues of carrying your basic essentials in a streamlined, minimalist set up. This ranges from EDC kits that are tailored to professions to basic setups that include personal security items such as knives and flashlights, among other things. The concept is to carry only what one needs for their daily tasks – nothing more, nothing less. I have attempted to adopt this mindset in order to increase efficiency in my life, yet the fear of unforseen circumstances is always at the back of my mind. What if someone were to be hurt? How do I address this issue without unnecessarily overloading myself with items that will never be used? For the average citizen, it is important to know what level of medical supply you are looking for and how you would want to use a potential first aid set up. In the past, I have personally set up first aid kits with the aid of a registered nurse; however, many people either include too many things that end up wasting money or too few items that would not be enough in an emergency. 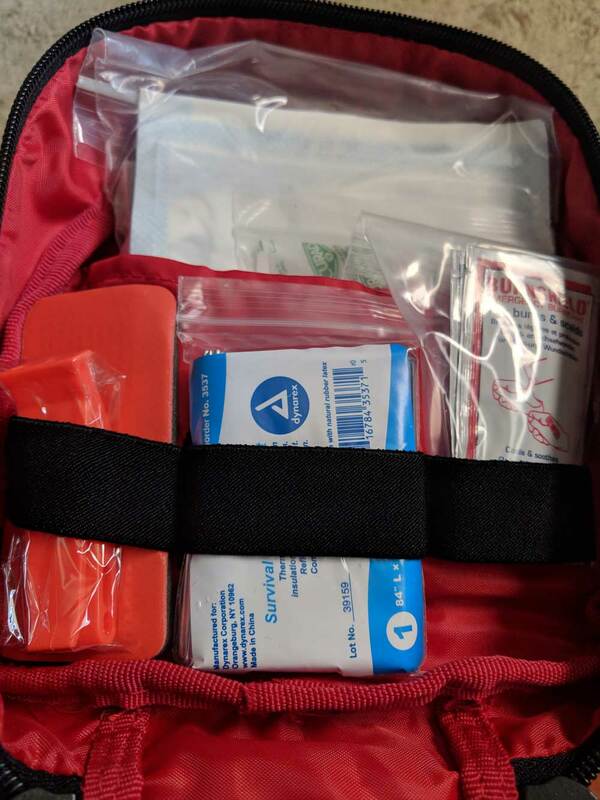 Personally, I have had to balance the desire to be overly supplied with easy storage, while also figuring out where to start for a basic first aid kit (for some people, it is much harder to start out than most). With frequent trips throughout the desert – where temperatures can reach to over 130 degrees Farenheit in the peak of summer and down to even 30 degrees Farenheit in the winter – and a car that has seen better days, having the necessary first aid/medical tools for extreme weather is critical for me. Perhaps you are an outdoors enthusiast looking for portable first aid that would meet your needs or a parent who likes to be prepared. This is where I would introduce you to MyFAK (My First Aid Kit). Looking at just the construction of the bag itself, it speaks to the high quality that MyMedic has invested in this kit. It’s incredibly compact, yet within the design of the bag, you really see how MyMedic aimed to eliminate any and all potential for complications with the bag to impede access to the supplies inside. Often times, the average user takes for granted that the bag or container will never factor into any potential problem utilizing the bag. However, from first hand experience, I know that zippers jam or that straps get tangled at the worst possible time. That is why – regarding design – my favorite aspect of the kit is the rip-away velcro panel. As seen on the website, this appears to be most utilized when the kit is strapped into a storage position such as behind a car seat’s headrest. The ability to rip away the bag and continue with medical assistance really seems to answer a problem most users may not even realize they had. Additionally, knowing that this kit is approved by OSHA and is eligible for FSA/HSA purchase increases (in my opinion) the attractiveness of buying in bulk for offices/companies and for personal preparedness. Now, taking a look inside, the MyFAK includes an EXTREMELY large list of supplies. Covering the areas of bleeding, burns, airway, sprains & fractures, topicals, medication, adventure & survival, and speciality, it is my opinion that the MyFAK is the best set up for those looking for a more advanced starting point than putting together their own kit. While there is nothing wrong with building your own first aid kit, choosing to purchase a MyFAK guarantees that you are getting the most essential items that match to your own needs and what you are looking for in a kit, in addition to a much more durable container. If you would like to view the contents for the basic kit, I have included them at the bottom of this review. It is my opinion that, in regards to personal safety supplies and devices, a customer really needs to sit down and asess their own personal needs and the amount of money that should match those needs. I have known way too many people who, for the sake of aesthetic or an image, buy items that will never be used or could be easily replaced with a lower-end version of the product without a problem. If you are someone who rarely ventures outside of their surroundings and is low-risk, I believe that you would not utilize the MyFAK to its full extent and would be wasting the supplies inside and your own money. You could easily put together a kit from Target or Walgreens, or buy a simple one on Amazon. However, if you are someone who is into high-risk sports or activities, or are in a situation where you are responsible for the well-being of others, I would really suggest the MyFak be on your list for consideration. I am also recommending this kit for off-duty law enforcment, fire and emergency personnel, and for schools as well. I would also recommend this kit for Scout leaders and other adults in a supervisory position. However, if you are emergency personnel and/or have more specialized first aid training, I would seriously suggest looking into the advanced kit, which may have additional supplies that would fit your level of training. Additionally, replacement supplies are available on the MyMedic website. Gauze Roll| 3 in. x 12.3 ft.
 Elastic Bandage | Velcro, 2 in. x 5 ft.
Disclosure of Material Connection: YBLTV Writer / Reviewer Katie Hernandez, received MYFAK | FIRST AID KIT from MyMedic in consideration for a Product Review.